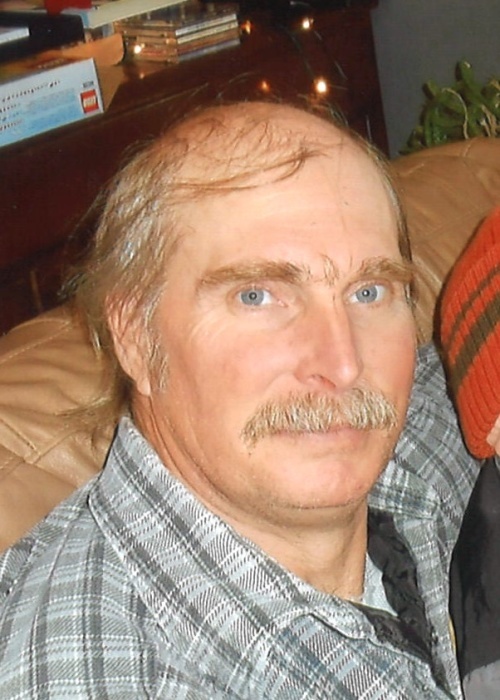 David K. Baker, age 57, of Terril, IA formerly of Holstein, passed away on Sunday, January 20, 2019 at the Avera McKennan Hospital and University Health Center of Sioux Falls, SD. A funeral mass will be held on Friday, January 25, 2019 at 11:00 AM at the Our Lady of Good Counsel Catholic Church of Holstein with the Msgr. Kenneth A. Seifried officiating. Burial will be at the Calvary Cemetery of Holstein. A visitation will be held on Thursday, January 24, 2019 from 5:00 PM – 7:00 PM at the Nicklas D. Jensen Funeral Home of Holstein. David Keith Baker was born January 1, 1962 in Ida Grove, Iowa to Joan (Streck) and Jerome Baker. Dave graduated from Holstein High School in 1980. After graduating, he attended basic training to be a paratrooper at Fort Benning, GA and was released because of a leg injury in 1983. Dave enjoyed many occupations from farm hand, to feed delivery, to construction and furniture building. He spent 11 years at Wilson packing plant in Cherokee, Iowa before moving to an acreage at Terril, Iowa. On September 6, 2009, Dave married Christine (Whitehill) Barfoot at their acreage. Dave and Chris became foster parents and in 2012 adopted Brad. Dave was diagnosed with lymphoma leukemia in 2012 and in July of 2014 received a stem cell transplant from his sister, Debbie. During his battle with cancer and the complications that followed he was never one to complain. Dave enjoyed fishing, gardening and woodworking and was a member of the NRA. He was a member of Our Lady of Good Counsel Catholic Church. He is survived by his wife Christine and son Brad; his parents, Jerome and Joan Baker of Holstein; two step-children, Tasida Barfoot of Ames, IA and Thompson Barfoot of Brandon, Florida; and step-grandson Levi Fisher; siblings, Debbie (Brian) Friedrichsen of Holstein, IA, Dan (Cyndi) Baker of Eagle, ID and Steve (Shelley) Baker of Janesville, WI. He is also survived by nieces and nephews, Sara Friedrichsen of Boyden, IA, Stacy (Chris) Brown and their children, Hannah, Logan and Austin of Holstein, IA, Brett (Allisa) Friedrichsen and their children, Carli, Henry, Lane and Colt of Holstein, IA, Joe Friedrichsen of Holstein, IA, Shelby and Jennifer Baker of Janesville, WI and Lindsey Baker of Eagle, ID; sisters-in-law, Cindy (Al) Landau of San Diego, CA and Cheryl Cooke of Boulder, NV; brothers-in-law, Ed Whitehill of Mason City, IA, Steve Whitehill of Belen, NM, Craig (JoAnn) Whitehill of Colorado Springs, CO; and Creighton Whitehill of Carlisle, IA; and many aunts, uncles and friends. He was preceded in death by his grandparents, Glenn and Bea Baker and Walter and Helen Streck.